Kosuke Kurokawa has over 30 years of experience in energy systems technology, including HVDC transmission and solar photovoltaics. Keiichi Komoto is a senior consultant in the field of renewable energy for Mizuho Information and Research Institute. Peter van der Vleuten is chairman of the Free Energy Foundation. David Faiman is professor of physics at Ben-Gurion University of the Negev and director of Israel's National Solar Energy Center. Masakazu Ito is an assistant professor of Integrated Research Institute in Tokyo Institute of Technology in Japan. 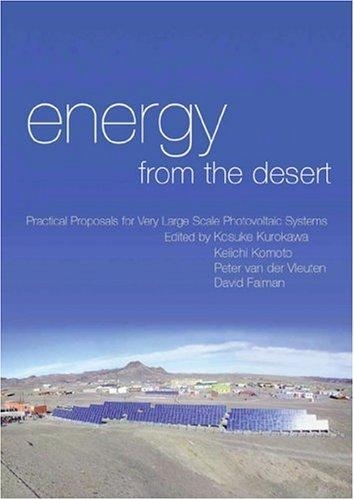 The world's deserts are sufficiently large that, in theory, covering a fraction of their landmass with PV systems could generate many times the current primary global energy supply. 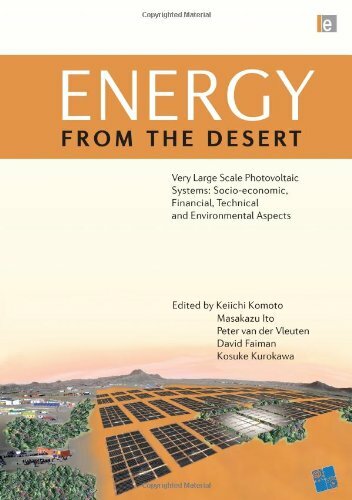 The third book in the "Energy from the Desert" series examines the socio-economic, environmental and financial issues surrounding the use of Very Large Scale Photovoltaics (VLS-PV). 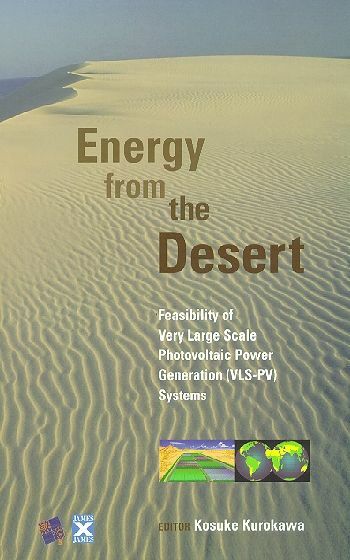 It provides detailed coverage of technology and financing options (including recent and future trends in PV technology), potential social benefits such as desalination and agricultural development, and environmental and ecological impacts of systems and how these can be monitored, illustrated by case studies from the Sahara and Gobi Deserts. The concluding section consists of a roadmap outlining the options and opportunities for future implementation of VLS-PV. Building on the key concepts and case studies of previous volumes, this will be a key text for policy-makers and investors in the field. Available online 9 November 2010. Algeria plays a very important role in world energy markets, both as a significant hydrocarbon producer and as an exporter, as well as a key participant in the renewable energy market. Due to its geographical location, Algeria holds one of the highest solar potentials in the world. This paper presents a review of the present renewable energy situation and assesses present and future potential of renewable energy sources (RESs) in Algeria. This paper also discusses the trends and expectation in solar systems applications and the aspects of future implementation of renewable energies in the Middle East and North Africa (MENA) region status. The problem related to the use of RES and polices to enhance the use of these sources are also analysed in this paper. In addition the available capacity building, the technical know-how for each RES technology and localizing manufacturing of renewable energy equipments are defined. The co-importance of both policy and technology investments for the future Algerian markets of RES and competitiveness of the solar/wind approach is emphasized. Some examples of policy significantly impacting Algerian markets are reviewed, and the intention of the new Algerian RES initiative is discussed.